If youre like me (before I researched this article), in terms of what you know about the Clouds, then youve picked up a few scattered facts here and there - theyre maybe 160,000 or so light years (ly) away, they are small irregular satellite galaxies of the Milky Way, Supernova 1987A is there, and perhaps a couple of other isolated tidbits of information. Well, Im here to change all that. Both the Large and Small Magellanic Clouds (LMC and SMC) are very dynamic, happening places. First, lets put the Clouds in context. Both are, of course, in the southern sky. The LMC is mostly in Dorado lying between 6h and 5h R.A. and -65 to -72 degree declination. The SMC lies about 23 degrees further west at 1h R.A. and -73 degrees declination in Tucana. Thus, they both lie roughly midway between the plane of the galaxy and the south galactic pole. The most recent information I could find (Sky & Telescope, August 1997, page 118) gives a distance of 180,000 ly to the LMC based on data from the Hipparcos satellite. Most prior sources give a distance of 160,000 to 170,000 ly. Unfortunately, I could not find an Hipparcos based distance for the SMC. If we can assume a similar correction for the SMC, then it lies at average (more about this later) distance of 200,000 ly. Being insufficiently motivated to dig out my high school trigonometry book, I instead used a protractor, ruler, pencil, and paper to estimate that this configuration places the Clouds about 80,000 ly from each other. Now that we have a mental picture of where theyre located relative to us and to each other, how big are they? Recent sources vary tremendously in size estimates, so well save that discussion for a bit later. Nonetheless, we can say that the LMC is the fourth largest galaxy in the Local Group while the SMC ranks from 5th to 8th depending on whose measurements are used. Given that there are 30 or so galaxies in the Local Group, nearly all of which are satellites of either the Andromeda Galaxy or Milky Way Galaxy, and if it is assumed that there is nothing special about the Local Group (i.e., most large galaxies will have satellites even though they may be too dim and far away to detect), then the Clouds are actually larger than the average galaxy in the universe and the Andromeda and Milky Way Galaxies are giants! Next, lets take a look at the Clouds in terms of their components. There are perhaps 15 billion stars in the LMC (estimates range from 10 to 20 billion) and about a quarter of that number in the SMC. The LMC also has at least 17 globular clusters of its own! While globulars in the Milky Way are billions of years old, some in the LMC are as young as 10 million years! (Im probably using too many exclamation points, but I cant help it. This stuff just floors me - figuratively speaking.) Both have a lower metallicity (in astronomer speak any element heavier than hydrogen and helium is a metal) than the Milky Way. The LMCs metallicity is only 60% that of the Milky Way while the SMCs is only 30%. Also, both Clouds have a higher gaseous (i.e., hydrogen and helium) content than their giant neighbor. Twenty percent of the SMCs mass is gas, 10% of the LMC is made up of gas, while only 5% of the Milky Ways mass consists of nonstellar gas. These ranges in both metallicity and gaseous content are nicely explained by assuming different star formation rates. Star formation in the Milky Way has proceeded most rapidly resulting in a higher evolutionary rate for element creation. In other words, the mass of the galaxy has been recycled more times through the stellar life cycle resulting a higher proportion of metals. Star formation in the SMC has proceeded at the slowest rate thus allowing fewer opportunities for heavier elements to be created. Also with a slower star formation rate there is, of course, more free gas (i.e., not bound up into stars) present at any given time. The metallicity and gaseous content, and thus historical (an important distinction as we shall see) star formation rate, of the LMC lies midway between those of the Milky Way and SMC. Earlier, I referred to an average distance of 200,000 ly to the SMC. This is because the SMC is actually a long, gently curved, roughly cylindrical galaxy. From our vantage point, we are looking nearly end-on down its length. The nearer end is about 170,000 ly away (applying an assumed, by me, Hipparrcos correction of +10,000 ly) while the further end is about 230,000 ly away (again applying the assumed correction). The SMC is about 15,000 ly in diameter and an incredible 60,000 ly long! Thats more than half as long as the Milky Way is wide! There is some indication that the SMC is split into two major sections separated by about 20,000 ly. Although the Clouds differ somewhat in content (metallicity and amount of gas) and differ radically in shape, they share three major traits. First, both galaxies, despite their historical slow star birth rates, are currently experiencing massive stellar production. Long exposure photographs reveal over 6,000 star clusters and a like number of nebulae in the LMC alone! 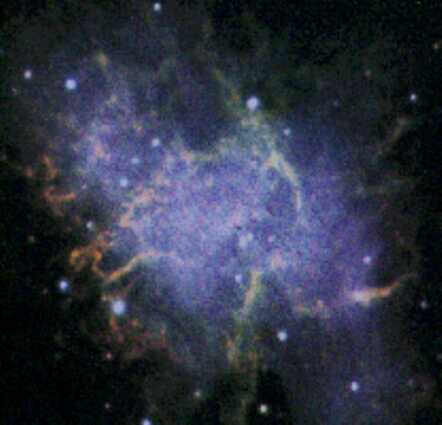 The Tarantula Nebula (30 Doradus or NGC2070) is by far the most famous example. It is believed that the Tarantula, which is 900 ly across, is actually a million-solar-mass globular cluster caught in the process of formation! Second, there is almost no doubt that both Clouds are gravitationally bound to the Milky Way. Even so, both are currently moving away from us at 76 kps and 22 kps (LMC and SMC, respectively). The third trait shared by the Clouds is a vast diffuse pool of hydrogen, which surrounds and connects both Clouds and trails away from them toward and beyond the south galactic pole! This huge sea and river of hydrogen is known as the Magellanic Stream. The current burst of star formation in both Clouds along with the Magellanic Stream can be accounted for by assuming a recent (100 million to 200 million years ago) close encounter with the Milky Way. This near miss (or perhaps collision) triggered the star burst, stretched the SMC out along our line of sight, ripped it into two parts, and pulled a great stream of gas from one or both galaxies, which (some studies show) is now falling onto the Milky Way! It is even possible that the SMC was once a part of the LMC and represents a section of that galaxy which has been torn away as a result of the encounter! Pretty darn dynamic Id say. Finally lets indulge a flight of fancy. First, think of some of the Hubble Space Telescope images youve seen of interacting galaxies with their stretched out streams of gas and stars. Now, open wide your minds eye. Imagine a vantage-point a few hundred thousand ly from the Milky Way. Youre looking straight up at a face on view of the Milky Way. You see a vast pinwheel of stars and glowing gas the nucleus glows yellow with the light of billions of older stars. A short bar extends from each end of the oval nucleus. Each bar gives rise to a bright largely continuous arm shining blue, pink and white with light of new born stars still immersed in the their natal clouds. Each arm wraps itself around the galaxy for more one complete turn resulting in a beautiful nearly symmetric spiral. Between the rather widely spaced arms are numerous branching and merging patchy spiral segments. Tearing your gaze from this wonder you notice off to one side about one and half galaxy diameters away a smaller oblong galaxy roughly one third as long as its giant neighbor is wide. It is bright with star formation and has a distinct dust lane running length wise along it. You realize you are seeing (at an angle of roughly 45 degrees) a smaller galaxy with some hints of spiral structure. Less than one galaxy diameter from the smaller galaxy is a line of bright stars and gas more than half as long as the large spiral is wide, stretching in a long curve back towards it. These are, of course, the Milky Way, the LMC, and the SMC. If there are any amateur astronomers in The Andromeda Galaxy with a clear line of sight in our direction, they certainly have a spectacular view of their neighbors in the Local Group.